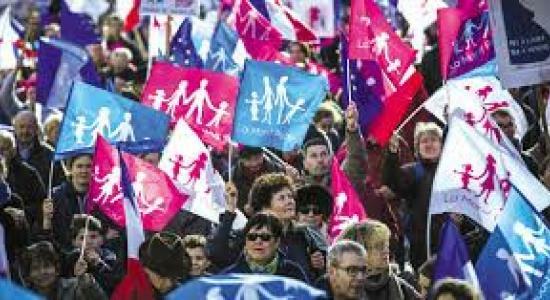 Thousand took to the streets in Paris and Lyon, France, protesting against the new laws easing abortion restrictions and legalization of gay marriage. They accused the French President Francois Hollande’s government of “family phobia”. The police said that eighty thousand people marched in the streets in Paris and twenty thousand rallied in south central Lyon carrying placards which read “Mom and Dad, There’s Nothing Better for a Child” and “Two Fathers, Two Mothers, Children With No Bearings”. The mass protest came a week after several thousand people marched against the policies of Hollande’s Socialist government like legalizing gay marriage, medically assisted procreation (MAP) techniques for lesbian couples and in vitro fertilisation (IVF). The demonstration had ended in clashes between police and protesters.